Vacation Rental by Owner. 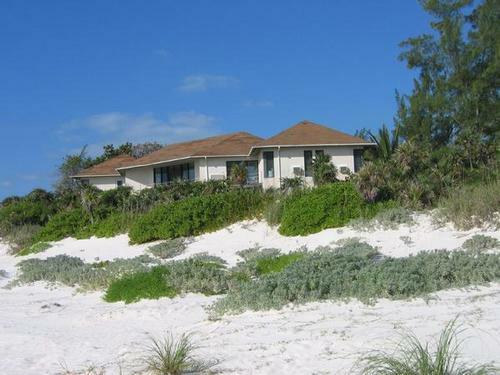 Holiday Villa in Windermere Island, Eleuthera, Bahamas, Bahamas. Late Deals, Special Offers. A light and airy ocean-front house. Vacation rental. A light and airy house perched on a 2 mile beach of pink and white sand, where it is rare to see another person. It has an open-plan living room and dining area, with a pretty Italian tiled floor throughout. Ceiling fans and sea breezes ensure the fitted air conditioning is rarely needed. Sliding doors open wide onto balconies and sun porch overlooking the beach. All the main living and sleeping areas have wonderful views of the ocean. There is a seperate fully-fitted kitchen, a wooden patio area outside, and steps leading down directly to the beach. The house is located on the private 5 mile Windermere Island adjoining the island of Eleuthera. As well as being just a few yards from the stunning Atlantic beach, a second more secluded beach cove nearby, with warm shallow waters, is ideal for small children. A cook/babysitter can be arranged, as can grocery shopping ready for your arrival.The daily maid service is included in the rental. This is a holiday location perfect for those wishing to "get away from it all". The peace and quiet of a desert island, with all the amenities of "civilisation" just around the corner. Eleuthera itself is one of the outlying "family islands" of the Bahamas, that are characterised by unspoilt, uncrowded beaches of pink and white sand and turquoise waters, and a leisurely pace of life guaranteed to be an antidote to the stresses of modern living. The nearby small Harbour Island, popular with film and rock stars, is famed for its pretty colonial-style buildings, and as a centre for breathtaking diving and snorkling. Wonderful fish can also be viewed on the coral reefs surrounding Windermere Island, and local attractions on Eleuthera such as the spectacular Glass Window Bridge and Hatchet Bay Caves are well worth a visit. Local fishing trips can be arranged (bone-fishing especially. 5 minutes walk from the house, the Club At Windermere provides a bar and restaurant, open November to May, and a swimming pool and tennis courts available all year round. The nearest supermarkets are 20-30 minutes drive, as are several local-style restaurants. Governor's Harbour and Rock Sound airports, within 40 minutes drive, have daily flights from and to Miami, Fort Lauderdale and Nassau. Taxis available. Car rental necessary. Price Includes:-Rate quoted is for up to 6 people. Add $50 per extra person per night. $1000 returnable damage deposit requested.